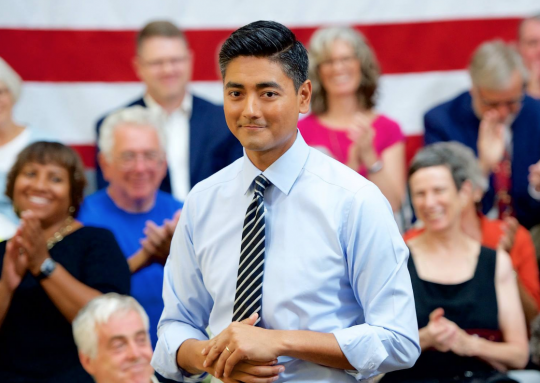 A legal complaint has been filed with the Ohio Elections Commission against Democratic congressional candidate Aftab Pureval alleging the candidate didn't document all campaign spending and spent funds from another campaign account on his congressional race. Lawyer Brian Shrive filed the complaint on behalf of Hamilton County resident Mark Miller alleging Pureval, the Hamilton County clerk of court, had spent $30,000 from his county campaign account on his congressional race and failed to document other spending, the Cincinnati Enquirer reports. Pureval and his campaign have denied any wrongdoing, with campaign spokesperson Sarah Topy saying Pureval did not break the law. "This is a phony complaint meant to distract from the issues that matter in this race," Topy said. "Aftab Pureval has acted legally and appropriately." However, Shrive was quite concerned by the campaign's filings. "These are serious violations … that could warrant criminal sanctions," Shrive said. "The expenditures raise a lot of red flags." The Enquirer looked into the $30,000 spent by Pureval's county campaign account around the same time as he kicked off his congressional campaign against incumbent Rep. Steve Chabot (R.) in Ohio's 1st Congressional District. NRCC spokesman Chris Martin also commented on the Enquirer's recent reports. "Looks like Aftab should take a break from measuring the drapes and get himself a better lawyer," Martin said. 1. That Pureval and his congressional campaign "disguised federal campaign contributions" to evade contribution limits. Pureval's mother, Drenko Pureval, made two $15,000 contributions by Pureval's clerk of courts campaign after her son announced his congressional run, the clerk of courts 2018 semi-annual report shows. The complaint says the donations were not intended to support Pureval'scampaign for re-election as clerk, rather they were made "for the purpose of evading the contribution limits applicable to federal candidate committees" and to supportPureval's federal campaign. 2. That Pureval disguised federal campaign expenditures on the clerk of courts campaign finance report and provided incomplete documentation. Among the unexplained expenses were spending on travel, media and consulting. On the issue of travel, the complaint questions a Jan. 8 payment of $2,884 to Joe Levy, the brother-in-law of Pureval's campaign manager, Sarah Topy, for "travel." It does not say where the travel was to or why the travel was necessary. There are three other travel payments with no explanation, the complaint alleges. On the issue of media, the complaint questions a $360 payment to Mark Byron, who photographedPureval's congressional race kick-off announcement. There is no payment to Byron in Pureval's federal campaign reports. On the issue of consulting, the complaint questions a $16,400 payment to GBA Strategies for consulting. There was a congressional poll done by the same company, the Enquirer found. Though the memo of the check is redacted with black marker, a close look at it shows the word "polling," the complaint alleges. 3. That Pureval misreported contributions. This allegation dates to 2017 regarding two campaign contributions totaling $750. The complaint notes Pureval filed amended campaign reports adding the contributions, yet those organizations don't note the donations in their own reporting. 4. That Pureval spent clerk of courts campaign account money testing the waters for a congressional run. The complaint notes eight expenses in 2017, including an Atlanta hotel, stakeholder meetings, airline tickets and a payment to the Murphin Ridge Inn in West Union, Ohio. This entry was posted in Politics and tagged Campaign Finance, Congress, Ethics, House of Representatives, Ohio. Bookmark the permalink.